Park Geun-Hye, the 11th President of South Korea. In many countries, it took years—most often decades—of struggle to achieve transparent rule of the people. It requires hundreds and thousands of burnt, bruised, tear-gassed, and bloody bodies to overthrow a hierarchical dictatorship and establish fair, representative governance. However, just like a beautiful glass sculpture, it often takes one push—or one crack in its core—to shatter it into pieces. In discussing South Korea’s regression from a pro-peace democratic nation to a broken system of authoritarianism, I speak from a personal, first-person point of view, because my country’s collapse is a personal issue. I can’t use a detached, analytic perspective because this issue speaks to so much more—to my heritage, to the love for my motherland, to my parents’ struggles, and to my own sense of identity as a Korean-American. And as a Korean-American, I have to fight it, the best way I know how, because Korea is no longer free and sovereign. 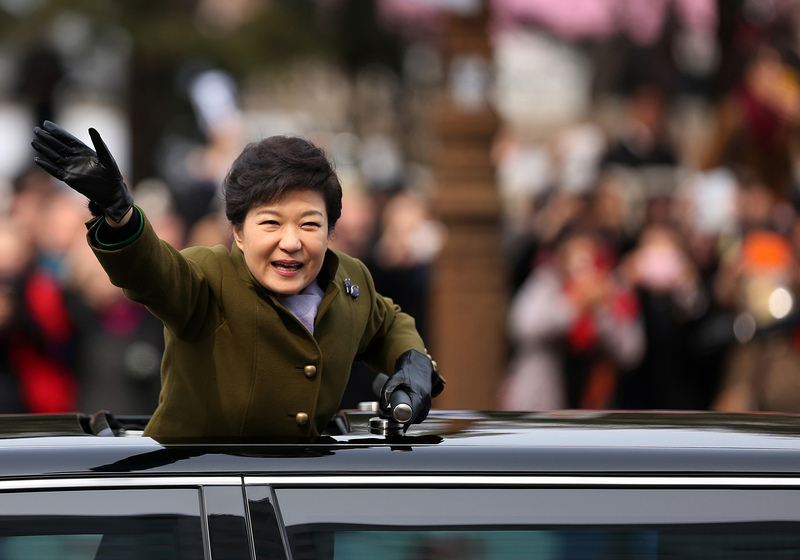 Park Geun-Hye (박근혜), the current conservative president of the Republic of Korea, is the daughter of a former military dictator, Park Chung-Hee (박정희). After seizing government control with a military coup d’état, he ruled with an iron fist from 1963 to 1979; and in 1972, he declared martial law to allow him to rule indefinitely, effectively retrogressing Korea’s democracy from its fragile infancy. In 1979, after the first tide of the pro-democracy protests, Park Chung-Hee was shot by Kim Jae-Gyu (김재규). His death, together with the death of Chun Doo-Hwan (전두환)—a succeeding dictator that ruled from 1979 to 1988—are etched into my parents’ bodies and souls as a symbol of their youth, and the student-led pro-democracy movement of the era. Many student leaders—all of them promising and charismatic individuals from Korea’s elite universities—were jailed, assaulted, and killed by the police that acted as these dictators’ arms. However, in the end, popular sovereignty was achieved. 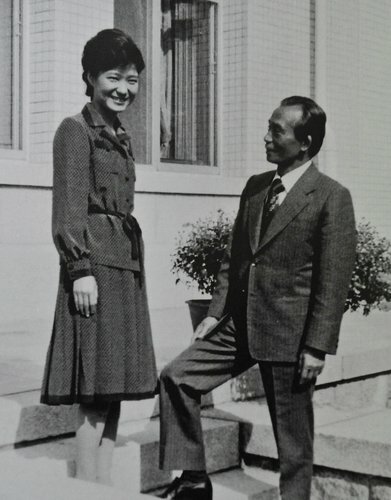 In multiple public occasions and interviews, Park Geun-Hye has claimed that she admires her father—not only with the love that daughter has for her father, but with esteem and reverence dedicated to a nation’s leader. Perhaps it is this admiration that has led the South Korean government under Park Geun-Hye to commission a state-led creation and issuance of history textbooks, which include excerpts that severely dilute Park Chung-Hee’s dictatorship. The materials from these textbooks will be taught in South Korean primary and secondary schools, in preparations for the state-examinations that will decide their university enrollment. In South Korea, university enrollment single-handedly decides one’s future. Thus, perhaps only naturally, the role of primary and secondary school teachers has deteriorated into simply funneling the right exam answers into the students. From now on, the diluted version of Park Chung-Hee’s dictatorship will be the “right answer” to the history exams; therefore, false history will be taught in South Korean classrooms, to highly impressionable children and teenagers who will carry the future of my motherland. Propagandist education is the most terrifying manifestation of a dictatorship; it is a unilateral, coercive, and impenetrable form of brainwashing that targets the most vulnerable. The Park Administration’s issuance of falsified textbooks does not make South Korea the “bosom of freedom,” as she proudly claimed during a direct address to North Korean citizens. Its implications are dangerously parallel to North Korea’s system of propagandist education that the South Korean conservatives so readily denounce and attack. Unfortunately, the Park Administration’s unravelling of South Korean democracy did not end with state-issued textbooks. The most recent blow came in the strangest, most absurd way possible: Choi Soon-Sil, a close religious confidant of Park Geun-Hye, has been single-handedly shaping the administration’s domestic and international policy decisions. 중앙일보—or Korea Joongang Daily, an influential newspaper in South Korea—has called Choi as being a part of “Pseudo-Christian shamanistic cult,” which combines “tenets of Buddhism, Christianity and Korea’s indigenous Confucian-shamanist movement, Cheondoism.” Choi has allegedly been responsible for editing Park’s official public speeches, directing cash flows to her non-profit organization, and rigging the favor of Ewha Women’s University for her daughter’s admission. In particular, most recent reports reveal that Choi has been amassing illicit fortunes through Park, who is suspected of single-handedly providing favorable state policies for businesses that offered large contributions to Choi’s foundations. On November 22nd and 23rd, South Korean prosecutors raided the company headquarters of Samsung, SK, and Lotte—which are multinational conglomerates with effective monopoly over the South Korean domestic market—over their donations to Choi’s foundation, and are currently investigating the donations’ linkages to the state-issued duty-free business licenses and merger approvals that they received. In South Korea, people are calling for Park’s impeachment. Massive demonstrations and protests have taken place all across the nation, against police forces that did not hesitate to use high-power water cannons. Korean communities from all across the globe—including that of my newfound home, London—have issued a declaration on the state of affairs (시국선언), mourning our nation’s loss of democracy. My identity as a Korean-American has never allowed me a singular, powerful sense of belonging; in fact, the concept of “home” is something that I still struggle to define. For the past two years, I have actively sought out to relearn and rediscover my heritage, through which I have come to see the bravery, the encapsulating compassion, and the dogmatic resilience of the Korean people. Through hundreds of yellowed-out pages and hours on hours of anecdotes, I have felt the strength of our women, the fearlessness of our youth, and our immovable desire for democratic sovereignty that have persisted from the Japanese occupation era, through the pro-democracy movement, to now. Nevertheless, I would be telling a blatant lie if I claimed that the sheer vulnerability of our sovereignty has not disillusioned and frightened me. The ease and the readiness with which Park sought to manipulate our democratic system have created a strange and bitter emotional impulse that threatens to estrange me from my own motherland. South Korea is no longer a hospitable place for ambitious, educated, and progressive youth: its government—along with its most powerful agencies—is riddled with corruption; job opportunities for new grads are evaporating into thin air, with its most recent valuation of youth unemployment rate soaring to 8.5%; and its economy is the most unequal it has ever been, emphasizing the implicit cultural expectations of hierarchical subordination, “lineage,” and connections. The concept of “power”—as a form of political, socioeconomic, and cultural dominance—should be a dynamic force. In all interpersonal, local, and national levels, power must comprise of meritocracy, sovereignty, and collective agreement. 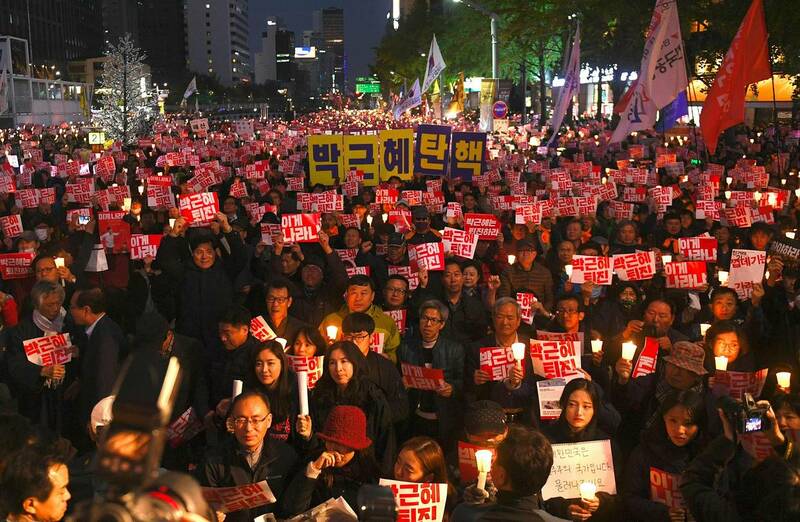 Unfortunately, this idea of democratic power has long been eroded in South Korea. But my very own father—who serves as a history professor, a writer, and a relentless activist—has sat me across from him on the dinner table, his usually stoic persona warmed and loosened by a few beers, and said that his love for his motherland only grows with its faults. In today’s globalizing world, the concept of patriotism and love for one’s country are becoming increasingly obsolete; however, for him and generations of Koreans, it is an integral part of their souls. When democracy erodes, they will fight, as they have always done for generations. And I will fight, the best way I know how, because I know that my country’s potential is limitless. Democracy is fragile, but it is resilient. Posted in Opinion and tagged Choi Soon-Sil, corruption, democracy, dictatorship, Lotte, Park Chung-Hee, Park Geun-Hye, Samsung, SK, South Korea. Bookmark the permalink.